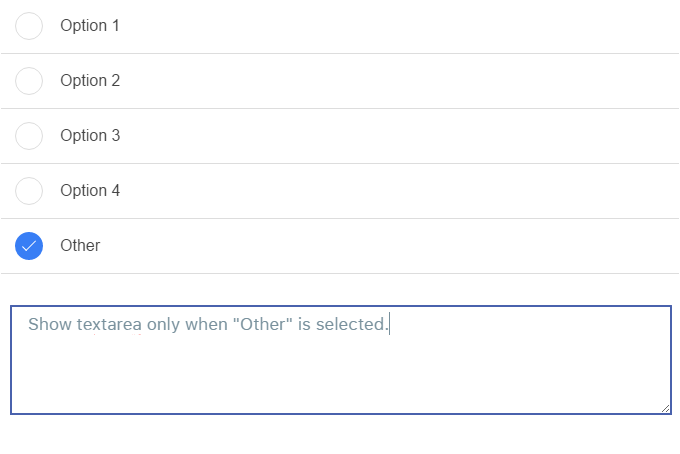 In Ionic checkbox is same as the input checkbox in HTML. It's just different in style and look like radio buttons. To create a ion-checkbox, you need a ionic directive "ion-checkbox". In this Blog, I am going show how to use ion-checkbox which looks like radio buttons to actually work like them, i.e only one option selected at a time. Furthermore, I am going to use ion-checkbox with ng-repeat and one without ng-repeat and still make them work together i.e if you select the checkbox which is outside the ng-repeat, the selected checkbox inside the ng-repeat must get deselected and vice versa. In first image the "other" option is out of ng-repeat as the textarea will be shown when it is selected. and in the second image input fields are there in "custom" section so it is outside the ng-repeat. The ng-repeat starts from index 0, so we pass a index of -1 in option that is outside the ng-repeat. So it doesn't matter how many items are there in ng-repeat but the index can never be less than 0. So if index is less than 0, custom option is selected and other options in ng-repeat deselected and vice versa.